The creative team of G. Willow Wilson, Mirka Andolfo and Ian Herring brings us a timely tale of elections, electoral shenanigans, and a happier ending than the one we got in real life in this fun, poignant, one-shot tale. 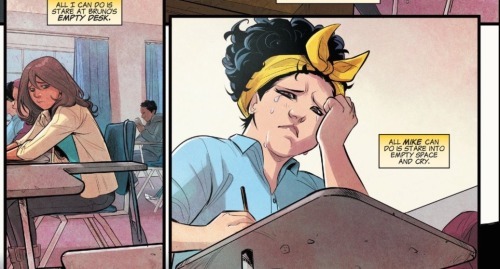 Kamala is back from her summer break in Pakistan, but school isn’t quite the same now that Bruno has transferred to a new school in Wakanda. As sad and guilty over it as Kamala feels, it seems that Bruno’s former girlfriend, Mike, feels even worse. Kamala also notices that Zoë has been eyeballing Nakia something fierce… what’s that all about? Well, we know what that’s all about, but the matter is left to be addressed in a future issue. Kamala’s somber wonderings are disrupted by the arrival of a new transfer student, her new brother-in-law, Gabe. Gibe used to go to school across town, but some sort of new redistricting initiative has led to his being transferred to Kamala’s school. It all seems quite strange and, as Ms. Marvel, Kalama is keen to find out what’s going on. Apparently, being a superhero garners one the ability to go to city hall and meet with the mayor whenever one pleases. Ms. Marvel meets with Jersey City’s mayor (who is not Steven Fulop but rather a fictional mayor named Woodby. Woodby seems to be in a tight bind; the electoral districts of Jersey City have been rapidly reshuffled, altered by some nefarious force. 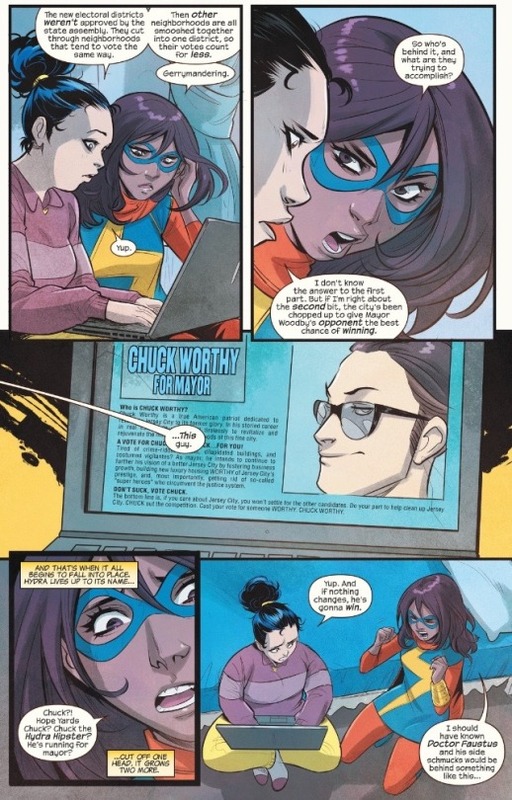 Woodby seems to be under the power of some form of mind control, but his will is able to break free for a brief moment, enough time to scrawl ‘help’ onto a piece of paper and show it to Ms. Marvel. That evening, Ms. Marvel teams up with Mike to try to get to the bottom of the matter. Mike’s research has discovered that the city’s electoral districts have been altered in a fashion to undermine and consolidate particularly voting demographics. Although the specifics are left unsaid, what is implied is that the districting has been altered so to de-consolidate liberal-leaning voting groups. This type of gerrymandering is most often used to suppress and disenfranchise voters who are people of color (a good account of successful, racist gerrymandering can be here). Upon further inspection, Ms. Marvel and Mike realize that the gerrymandering has been enacted in an effort to ensure the election of Chuck Worthy, the dastardly goon also known as ‘The Hydra Hipster.’ It’s clear that all of this has been a plot by the evil Dr. Faustus to garner the mayorship of Jersey City. As Mike points out, the best and only way to effective combat voter suppression is to somehow engineer a surge in voter turnout. There’s actually a third party candidate, one far superior to both the incumbent, Mayor Woodby, and the sinister challenger, Chuck Worthy. 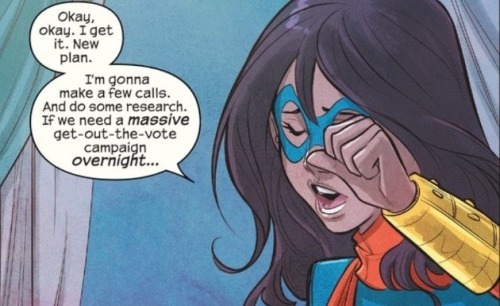 If Ms. Marvel can somehow get enough people to get out and actually vote, there’s a very good chance this third party candidate (who looks to be something of an amalgam of Bernie Sanders mixed with Tammy Duckworth) could win. 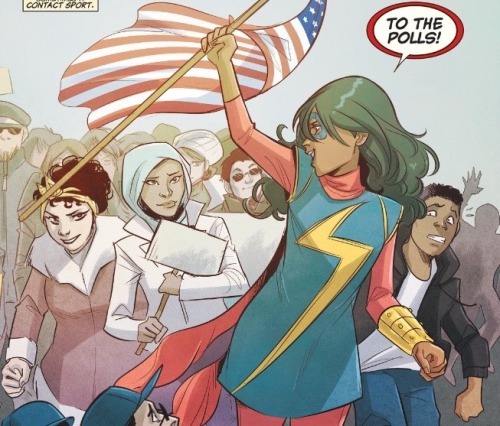 What follows is a rather inspiring series of Ms. Marvel’s interaction with the populace of Jersey City, informing them of just how important their vote is, how the stewardship of their community and country is in their hands; that voting is both a privilege as well as a responsibility. And, in a turn of events that I suppose can only happen in comics, Ms. Marvel’s efforts pay off. Voter turnout reach a record high and the third party candidate is elected the new mayor, dashing Faustus’ dastardly scheme. The alterations in districting will no doubt be changed back, but Gabe is not sure he wants to return to his old school. Being Kamala’s classmate has proven hectic and a bit scary, but also thrilling and exciting. Maybe he’ll want to stick around. This was a rather bittersweet issue. It was fun, topical, well-written and beautifully illustrated. Yet it was also rather painful in that the happy ending that Ms. Marvel fought to achieve is paralleled by something quite the opposite here in the real world (or to be more specific The United States). 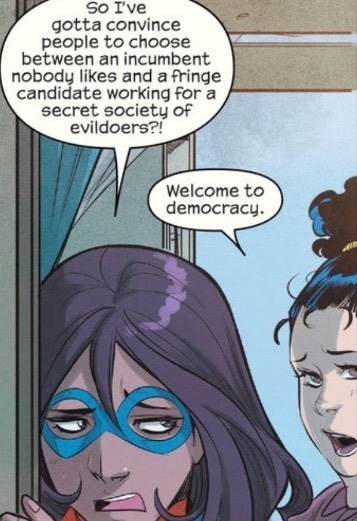 I apologize in advance for letting my own political leanings be so evident, but I figure fans of Ms. Marvel by and large maintain a relatively similar mindset. Gerrymandering did indeed impact the results of this month’s presidential election. The suppression of minority voters have been reported in states ranging from North Carolina, Pennsylvania, Florida, Wisconsin, and Ohio . Such suppression included unconstitutional voter identification checks, polling place closures, voter intimidation efforts, and baffling overt restrictions on voter registration. (a more detailed, albeit admittedly left-wing, account of these matters can be found here, here and here). The sadness over the fact that things appear to be much more just in the Marvel Universe compared to reality notwithstanding, this issue acts as a nice balm to cool a bit of the pain that the US Government is about to be taken over by a pack of unqualified and deplorable authoritarians. It’s a bit fun to see Donal Trump represented in the form of the witless and evil Chuck Worthy; with the nazi manipulator, Dr. Faustus, as a stand-in for Trump’s head of propaganda, Steve Bannon. If only Kamala Khan were a real person… perhaps our future would be much more bright. As it stands, I’m just hoping that the incoming national security adviser, the anti-Muslim zealot, Michael Flynn, doesn’t launch a crusade to put an end to Ms. Marvel’s publication. Fingers crossed! Anywho, Ms. Marvel #13 is powerfully recommended. Five out of Five Lockjaws!